Turdirostris rufescens Reichenow, 1878, Liberia. Monotypic. Endemic African genus Illadopsis has been merged by various authors into Asian genera Malacocincla or Trichastoma. English: Rufous-winged illadopsis; French: Akalat a ailes rousses; German: Rostschwingen-Buchdrossling. 7.2 in (18 cm); 1.2 oz (35 g). Profoundly nondescript thrushlike bird, as are most of the other six African members of the genus. Sexes alike. 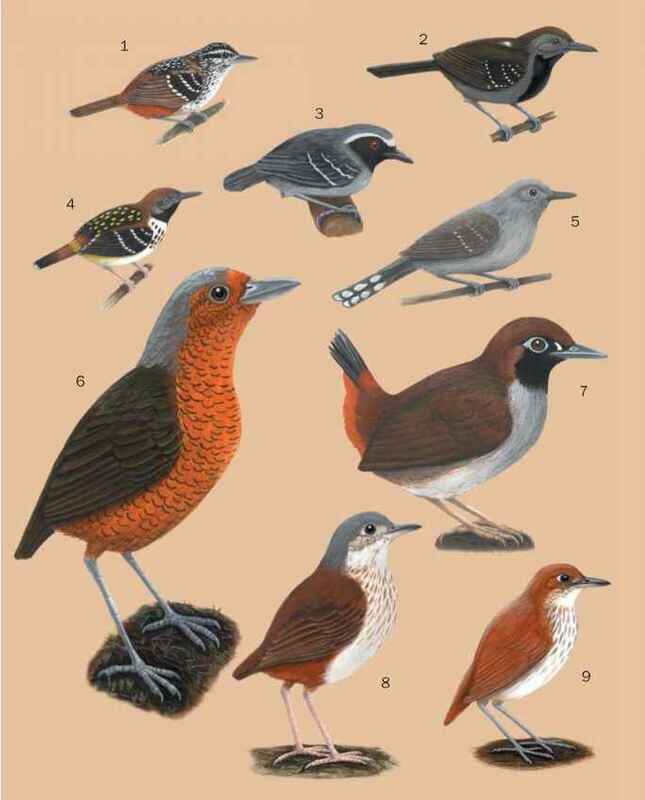 Rufous-brown dorsally, whitish ventrally, with indistinct brown wash on chest and brownish gray sides. Eyes dark; legs and feet pale. Endemic to Upper Guinea forest, from southern Senegal to Togo. Undergrowth in primary and disturbed forest. Ground dweller. Found in pairs or small flocks, sometimes associates with other species of insectivorous passerines. Territorial. Actively searches the ground for insects and tiny frogs, scratching at substrate with feet. Near Threatened due to former paucity of observations, and continuous destruction of forests throughout narrow range. Recent surveys have found species common in some localities, and occurring in areas where previously unrecorded. Population densities in logged forest are a fraction of those in primary habitat, but has been found in plantations and open thickets.